Pregnant women who have previously delivered via Cesarean delivery may be given the option to have a repeat C-section or pursue a vaginal birth after Cesarean (VBAC). This may also be referred to as a TOLAC (trial of labor after cesarean). VBACs are not for everyone. They can increase the risk of serious health complications and emergencies such as uterine rupture (where the previous C-section scar tears, causing the baby and placenta to move into the mother’s abdomen) (1). While uncommon, uterine rupture can cause severe conditions like blood loss, birth injuries, hypoxic-ischemic encephalopathy (HIE), and cerebral palsy. Because of the severity of uterine rupture, emergency C-sections must be performed within 3-to-17 minutes of the signs of rupture (2). About 60-80% of women who have had prior C-sections and no other risk factors can successfully deliver a baby vaginally with their future pregnancies (1). Despite this rate of success, however, there are still obstetrical situations in which VBACs are very dangerous and should not be advised. In fact, some hospitals do not offer VBACs because they do not have the staff or resources to handle them (1). According to Medscape’s VBAC data, 40-50% of women who had a previous cesarean delivery pursued VBACS in 1996 (3). In the years following, however, the rate of VBAC deliveries across America decreased dramatically. In 2002, as few as 20% of patients who had a previous cesarean attempted VBACs. In 2005, that number had already dropped substantially, with only 10% of women with previous cesarean deliveries having TOLACs. This massive shift reflected many doctors’ resistance to pursue a VBAC based on complications they had experienced in past TOLACS. In recent years, VBACs have steadily been attempted on fewer than 20% of women who have had prior C-sections (3). What is the difference between VBAC and TOLAC (trial of labor after cesarean section)? TOLAC stands for trial of labor after C-section. It refers to a planned attempt to labor and deliver vaginally by a woman who had a C-section in the past. TOLAC differs from a VBAC delivery in that a TOLAC has not yet resulted in a delivery; in other words, a TOLAC becomes a VBAC once the baby is birthed vaginally. So, a TOLAC has two possible outcomes: a completed VBAC, or a failed trial of labor that results in a repeat C-section delivery. VBACs carry with them attendant risks. While many low-risk mothers may have a successful VBAC, they should be provided with information that ensures they can give their informed consent about the risks of VBACs. The most serious risk associated with vaginal birth after C-section is uterine rupture (4). During labor, pressure builds in the uterus. If there is scar tissue in the uterus from a previous C-section delivery, this pressure can cause the uterus to tear or rupture (5). Uterine rupture typically results in expulsion of the baby and the placenta into the mother’s abdomen. When this occurs, there often is hemorrhaging (rapid, uncontrolled bleeding) that can cause the baby to be severely deprived of oxygen (hypoxia). This can lead to permanent brain damage from hypoxic-ischemic encephalopathy (HIE) and related birth injuries, potentially resulting in developmental delays and cerebral palsy. Additionally, uterine rupture can necessitate a hysterectomy or cause infant death. Uterine rupture is life-threatening for both mother and baby. While the risk for uterine rupture appears low (estimated between about 0.25% and 1.5% in low-risk vaginal birth after C-section deliveries), the outcome can be devastating (4). When the uterus ruptures, medical professionals must act quickly (within 3-to-17 minutes of rupture). It is imperative that the hospital is equipped for immediate emergency C-section delivery. This minimizes the chances of fetal oxygen deprivation and hypoxic-ischemic encephalopathy (HIE) (5). The mother is being induced (in the current pregnancy). ACOG recommends against the use of Cytotec (misoprostol) for women undergoing a VBAC. Pitocin (synthetic oxytocin) may also increase the risk of uterine rupture. Medical professionals must consider these risk factors for VBAC and explain their dangers to the patient. Uterine rupture with immediate operative intervention has shown to have positive outcomes (2). If a woman has a uterine rupture, the doctors may need to remove the uterus (hysterectomy) and perform a blood transfusion (5). When VBAC delivery attempts fail, a C-section is required. Medical professionals must discuss the potential for an emergency C-section with the mother and obtain informed consent. Discussing these considerations with a medical professional allows expectant mothers to make informed, educated decisions regarding their delivery plans and to understand the scenarios in which a C-section is necessary. If a patient has not been adequately informed and the mother or baby is injured during a VBAC or attempted VBAC, there may be grounds for a medical malpractice case. Who can pursue a VBAC? Have one previous cesarean delivery with a low-transverse uterine scar, have no other problems that would prevent a VBAC, and are counseled about a VBAC. Low transverse uterine scars are low, side-to-side cuts made across the thinner part of the uterus (10). This is the most common type of c-section scar and carries the least likelihood of uterine rupture of all of the c-section scars. Have two previous low-transverse cesarean deliveries, have no other problems that would prevent a VBAC, and are counseled about a VBAC. Have one previous cesarean delivery with an unknown uterine scar as long as it is not suspected that that scar was a classical uterine incision. Are having a single baby (as opposed to twins, triplets or other multiples). Or one previous low-transverse cesarean delivery who are otherwise good candidates for a twin vaginal birth. The patient is pursuing a TOLAC delivery that will have continuous fetal heart rate monitoring. The patient ultimately made the decision to undergo a TOLAC after counseling with their obstetrician or obstetric care provider and a consultation with this provider wherein the risks and benefits of a TOLAC and a repeat cesarean are discussed. At this point, the patient’s informed consent will be acquired. Documentation of this consultation should be made in the record. The patient is pursuing a TOLAC at a facility capable of administering emergency services. The patient is pursuing a TOLAC in a Level I center. The patient is pursuing a TOLAC in a facility that can provide an emergency cesarean delivery. The patient is not pursuing a homebirth TOLAC. Who shouldn’t have a VBAC? A prior high vertical or “classical” uterine incision (an up-and-down cut made in the upper part of the uterus) or an unknown uterine incision that is suspected to be high vertical (1, 9). High vertical incisions carry the highest risk of uterine rupture (10). Will I be induced for a VBAC? Induction for VBAC is an option, though it is often not recommended. Medical induction of labor is always something that must be carefully monitored to prevent the risk of hyperstimulation (when uterine contractions come on too strong and too fast, keeping the placenta from replenishing the oxygen stores that go to the baby). Induction using drugs such as Cytotec and Pitocin need particular monitoring because the risk of uterine rupture with VBACs is higher (especially with Cytotec, which ACOG recommends against using in these cases) (8). Misoprostol should not be used for induction or cervical ripening in patients at term who have had a previous major uterine surgery or cesarean delivery (9). Pushing hard and fast contractions in the context of existing uterine scarring can significantly increase the risk of uterine rupture and massive hemorrhage. Can I have an epidural with a TOLAC? Epidural analgesia can be administered during a TOLAC (9). Which is safer: VBAC or C-Section? VBACs and C-sections each have their own attendant risks. Doctors who recommend one over the other should balance the relative risks and benefits of each procedure, and carefully explain these to their patients. Ultimately, a TOLAC is associated with greater overall risks than an elective repeat cesarean delivery (16). How soon can moms have a VBAC after a C-Section? In the context of VBACs, the risk of uterine rupture is lower for women who have had a C-section more than 24 months ago (13). The risk increases with the shorter the time elapsed between pregnancies. Sometimes errors in judgment or practice by physicians and other medical staff can occur during a vaginal birth after C-section delivery. These can cause permanent and serious injury to the baby. Any medical mistake and deviation from care standards that results in injury to the mother or baby is considered medical malpractice. Failure to adequately inform the patient of risks involved with VBAC and obtain a signed consent. 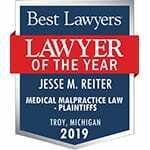 In this video, attorney Jesse Reiter discusses uterine rupture, VBAC, and HIE. FAQs: Can I have a vaginal birth after a C-section (VBAC)? Uterine rupture after previous cesarean delivery: maternal and fetal consequences. Leung AS – Am J Obstet Gynecol – 01- OCT – 1993; 169(4): 945-50. From NIH/NLM MEDLINE. Vaginal birth after cesarean delivery. ACOG Practice Bulletin No. 205. American College of Obstetricians and Gynecologists. Obstet Gynecol 2019;133:e110-27. Landon, Mark B. et al. Landon, M.B., Hauth, J.C., Levene, K.J., et al. Maternal and Perinatal Outcomes Associated with a Trial of Labor after Prior Cesarean Delivery. N Engl J Med 2004; 351:2581.